Check out our install write-up on Jeepin.com. Now Jeep Cherokee XJ owners can add larger tires and wheels and get the bold look of pockets with Bushwacker's new pocket style Cut-Out Flares. These flares give the Cherokee XJ 3-5" of extended tire coverage and let you open up the wheel well for maximum tire clearance. Best of all- they're designed using special external pocket mounts that cover the original factory holes. 100% UV protection - that means no chalking, no cracking and no warping. Matte black finish or easily custom painted. Made in the USA. 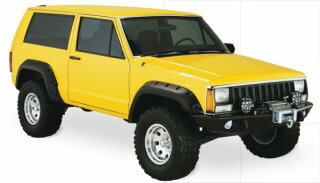 These flares will fit 97-01 Cherokees, however special care must be taken during install due to the windshield washer fluid reservoir located in the driver-side front fender as well as the way the rear bumper end caps fit with the flares. OEM matte black finish, or easily custom painted to match or accent any vehicle.